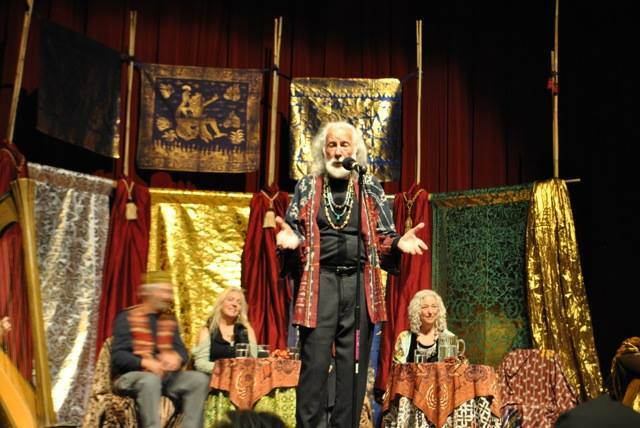 Rumi’s Caravan was first assembled in Sebastopol, CA in 2000 as a vehicle to convey our love of the oral tradition of poetry. It is our experience that when poetry – learned by heart and embodied – is spoken, it carries something of Soul with it and is, at once, more apprehensible and more meaningful to the listener than poetry read from a page. To help restore the oral tradition of poetry, to inspire audiences with a new imagination of the possible. The Caravan is both an event and a performance company. In addition to the annual event in Sonoma County, the Caravan has performed in Oakland, Gualala, Chico, Sonoma, and Redding/Mt. Shasta. All proceeds from our performances go to support local community organizations such as the Center for Climate Protection, the Siskiyou County Public Library, the Gualala Arts Council, the Ceres Community Project, Youth Speaks. the Middle East Children’s Alliance and others. Perhaps more importantly, Rumi’s Caravan has been part of a growing international renaissance of interest in poetry and story learned and shared by heart. In this small way we hope to contribute to the restoration of the wholeness of the world.